It's time to upgrade our voting system but lack of confidence in cybersecurity is holding the upgrades back. Who is most likely to opt-in for internet voting? Our deployed military members and overseas friends and family in organizations like the Peace Corps, have the hardest time voting despite their dedication to defend and uphold our democratic values. While the Uniformed and Overseas Citizens Absentee Voting Act (UOCAVA) ensures our overseas patriots are able to vote, their turnout rate is approximately seven percent. That’s not enough to be representative of their political consensus. Nor is the average turnout rate for presidential and midterm elections. For the past 10 presidential and midterm elections, the average turnout rate is 56.7 percent and 36.7 percent respectively. Outside of personal reasons, millions of Americans are disenfranchised by our current voting infrastructure due to disabilities yet there’s no telling when/if there’s an update coming. If a major key to the success of our democracy lies in citizens’ participation, how long will we allow it to be ‘ok enough’? The argument for internet voting stems from accessibility. In 2016, the current voting system left more than seven million eligible, registered citizens unable to vote due to illness/disability, transportation and scheduling problems, or inconvenient polling location according to the U.S. Census Bureau. Even though the methods above are only authorized for UOCAVA voters, it shows governmental awareness of the need to make voting more accessible to all voters. With the rate at which technology advances and society consumes it, even the opposition is aware of the inevitability of implementing an internet voting system. As Jeffery Stern, Operations Manager at mobile voting software company Votem explains, “Today there exists this wide gap between that inevitability down the road and progress being made towards it.” That progress is being delayed due to the security standard to which we hold voting systems. It is so high that if actually enforced, it would invalidate our current voting infrastructure along with the internet in general. According to Weidman, “I think thinking rationally we’re never going to get to a point where 100 percent security is a possibility. We’d have to tear down the internet and start over.” That can’t happen. Not in the digital world we live in today. Nor can we continue to rely on paper ballots or faulty polling stations. Votem is a founding member of the Department of Homeland Security’s Sector Coordinating Councils that secure elections critical infrastructure and has been officially registered to participate in the U.S. Election Assistance Commission’s Voting System Testing & Certification Program. There have been over 12 million votes processed on their blockchain platform from dozens of successful state and county elections. Regardless of all this trackable success, Stern believes there is an omnipotent hacker in skeptics’ minds that is undetectable. Yet we employ the internet for many other high-risk transactions (i.e. banking). A poll conducted by Soliant Consulting, a custom software development company, found both Democrats and Republicans are likely to vote online should the option become available; however, Democrats (64%) are more likely to than Republicans (56%). Had it been available during the 2018 midterm elections, it’s likely Alabama, West Virginia, and Colorado would have seen different results on ballot measures that tend to be polarizing. Presented by three superintendents, Amendment 73 would have created a tax bracket system and increase taxes on incomes greater than $150,000 per year, raise corporate income tax, and use these taxes to create the Quality Public Education Fund. The measure lost, only gaining 44 percent of votes. Despite the increased need, funding for education hasn’t increased since the cutbacks during the 2008 recession. Amendment 73 would have raised $1.6 billion for public education. Amendment 2 on Alabama’s 2018 ballot enforced a conservative stance on abortion rights and funding. Representative Matt Fridy (R-AL) of Alabama’s 73rd district wrote Amendment 2, stating the state of Alabama does not protect the right to abortion or require funding of abortions. The measure won with 59 percent of votes. West Virginia’s ballot had an almost identical measure. Amendment 1 states nothing in the state’s constitution secures or protects the right to abortion or requires the funding of it. Similar to Alabama’s, the measure was sponsored by Republicans like Representative Patricia Rucker (R-WV) and 14 other Republican Representatives. With 52 percent of votes, Amendment 1 barely won the majority vote which raises the question, would it have lost had internet voting been available? Going further, had internet voting been available in 2016, we most likely would have a female president. The near losses in Florida and Pennsylvania cost Democrats the 2016 election. While Arizona, Wisconsin, Michigan, and North Carolina also had near losses, Florida and Pennsylvania had more citizens registered as Democrats than Republicans. But where were they on election day? According to NPR, Democrats are less likely to vote along with the impoverished, those of hispanic or asian descent, and as usual, younger generations. All of whom tend to lean left on the political spectrum. Their reasons range from feeling uninformed to feeling left out of politicians’ agenda. Despite the existence of laws enforcing and protecting citizens’ right to vote, those facing illness/disability or who are paid on an hourly basis are still at a disadvantage. Even more so since the Supreme Court removed key parts of the Voting Rights Act. The 2013 Shelby County vs Holder case caused the invalidation of the coverage formula that identified jurisdictions, namely ones with a history of discrimination in voting, who needed federal preclearance to pass new election or voting laws. Since then, nearly 1,000 polling stations closed prior to the 2018 midterm elections. While 2018 saw the highest voter turnout in years, voter suppression tactics were present in multiple states ranging from fake robocalls racially harassing voters to fake flyers from ICE intimidating voters into not going to polling stations. The introduction of Internet voting may alleviate these issues so they never happen again. Crain, Abbey. "Alabama passes anti-abortion amendment." AL.com, Nov. 2018, https://www.al.com/news/2018/11/alabama-passes-anti-abortion-amendment.html. "Electronic Transmission of Ballots." NCSL, 15 July 2018, http://www.ncsl.org/research/elections-and-campaigns/internet-voting.aspx. File, Thom. "Characteristics of Voters in the Presidential Election of 2016." Census.gov, Sept. 2018, https://www.census.gov/content/dam/Census/library/publications/2018/demo/P20-582.pdf. Khalid, Asma, et al. "On The Sidelines of Democracy: Exploring Why So Many Americans Don't Vote." NPR, 10 Sept. 2018, https://www.npr.org/2018/09/10/645223716/on-the-sidelines-of-democracy-exploring-why-so-many-americans-dont-vote. Small, Jeremiah. 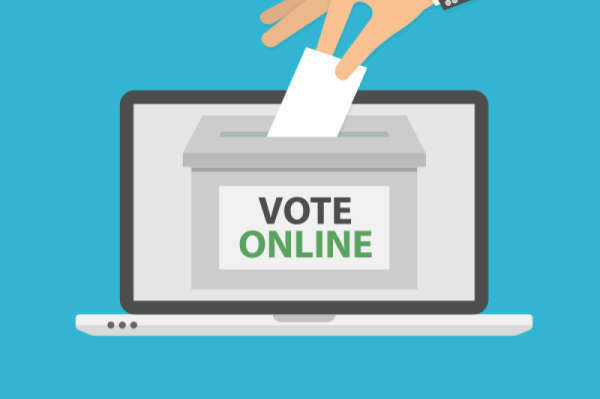 "Would You Vote Online? [Infographic]." Soliant Consulting, 16 Sept. 2016, https://www.soliantconsulting.com/blog/would-you-vote-online. "Statewide Ballot Measures Database." NCSL, 7 Nov. 2018, http://www.ncsl.org/research/elections-and-campaigns/ballot-measures-database.aspx. Stern, Jeffery. Personal interview. 21 Jan. 2019. The Great Poll Closure. The Leadership Conference Education Fund, Nov 2016, http://civilrightsdocs.info/pdf/reports/2016/poll-closure-report-web.pdf. Weidman, Georgia. Personal interview. 13 Dec. 2018.